Safety. Your safety. The safety of your loved ones and all road users. This has always been paramount to us and what we have focused on while developing our new brake pad production technologies. This is what drove us to create the Compress Control System, a solution which allows us to closely monitor the quality of Breck products. When brake pads are made, a number of different components are mixed, forming a so-called friction mixture. The Compress Control System ensures that all of the components of the mixture are always added in the same amount. The composition of the friction material, its repeatability and uniformity are just a half of the story. The other is the process of pressing, which, in the case of Breck brake pad manufacturing, is performed exclusively on fully-automated lines. These lines automatically weigh the friction material and the underlayer and automatically distribute them in order to achieve uniform thickness of both layers. This also ensures uniform thickness of the friction material and control of key process parameters, like temperature, time and pressure. Ultimately, we achieve repeatable products of very high quality. 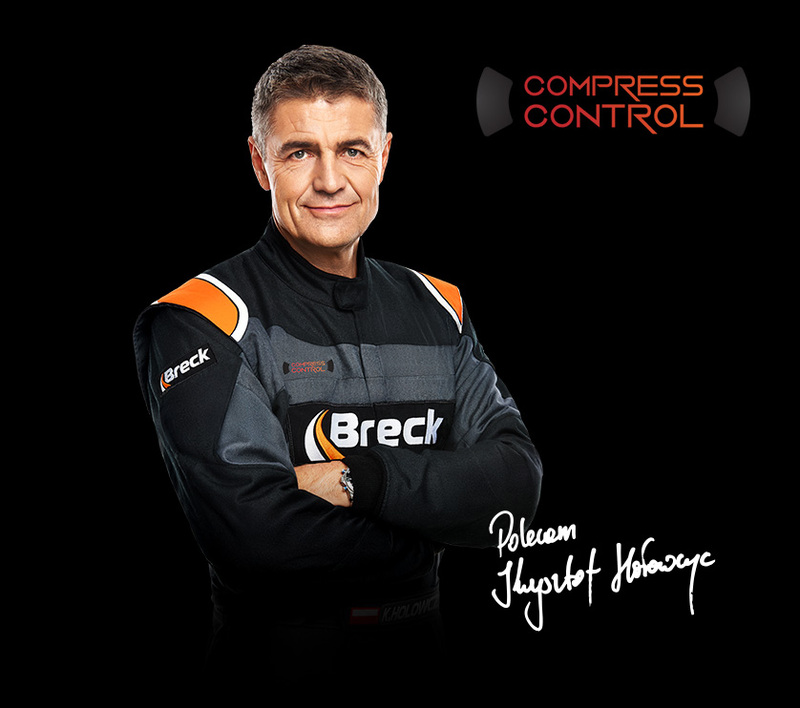 Owing to the Compress Control System we can be sure every time that each and every Breck brake pad is made of top-quality friction materials to guarantee safe braking. Our brake pads ensure reliable and controlled braking of both axles in all conditions. Owing to cutting-edge manufacturing lines meeting OE standards, parameters of the production process are under constant scrutiny and always meet the requirements of the latest standards valid in the automotive industry. 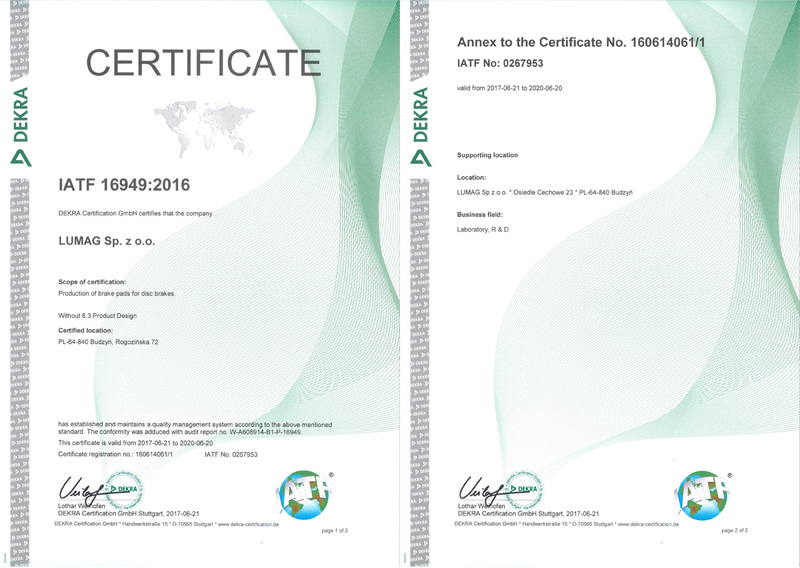 High and repeatable quality of Breck pads is confirmed by ECE R-90 certificates. This means that they had been meticulously tested and the results achieved were deemed successful in comparison to OE (original equipment) materials. 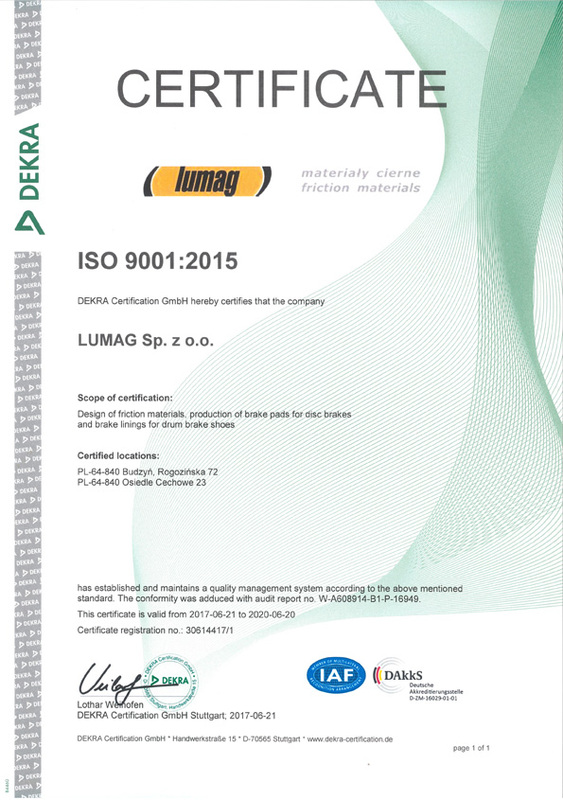 Certification trials are run exclusively in accredited laboratories, such as TÜV SÜD or PIMOT (Polish Automotive Institute). However, we treat these requirements merely as a starting point and always strive to exceed them. 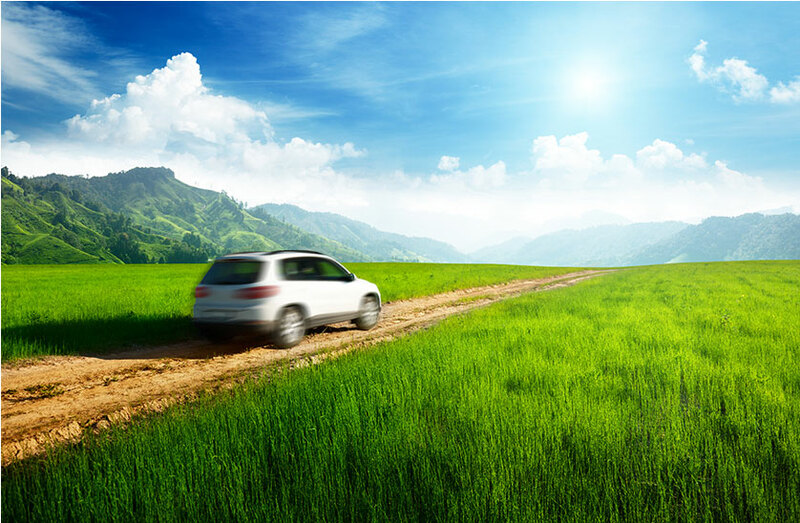 All our products are additionally tested in many specialized ways both in laboratory conditions and on vehicles. 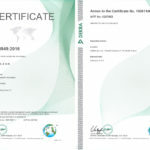 Quality assurance procedures we use on a daily basis are compliant with ISO 9001:2015 , ISO 14001:2015, PN-N-18001 standards as well as the IATF 16949:2016 technical specification, as attested by the following certificates. 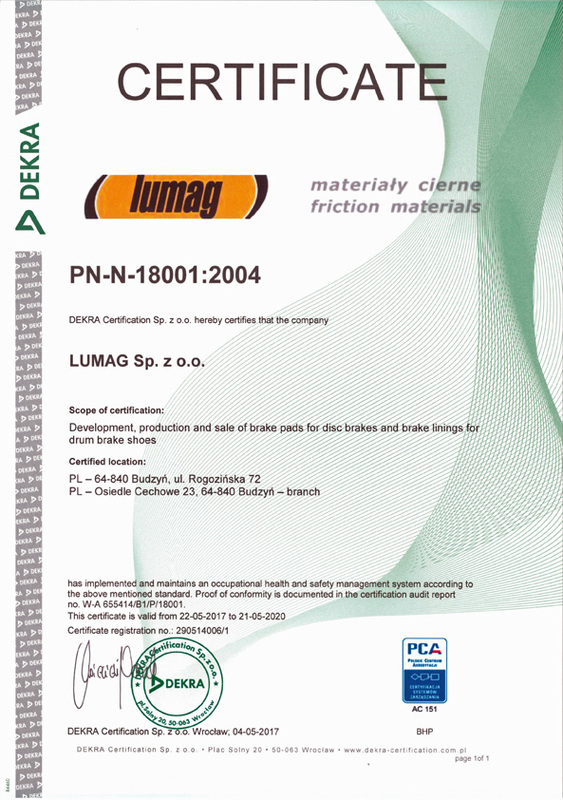 Top quality of Breck products is the result of long-standing expertise and work on friction materials of the LUMAG Research and Development Department. We are constantly controlling the quality of our brake pads, employing specialized and sophisticated research methods. We check the operation of brakes in various road and weather conditions. Braking efficiency tests in relation to speed, temperature and braking system pressure are performed on cutting-edge dynamometer stations. The most modern of them is a dynamometer inertia testing station, unique in Poland, with an NVH (noise, vibration, harshness) testing function. This machine enables us to run extremely detailed tests, with a serious contribution to the future top quality of Breck brake pads. For many years we have been cooperating with research institutions in Poland and other European countries, such as: the Poznań University of Technology, Industrial Automotive Institute (Przemysłowy Instytut Motoryzacji), TÜV Nord Essen, TÜV SÜD Czech from Prague, Applus+ IDIADA from Spain. Our R&D Department performs tests of OE products and our own products in order to select the best friction materials. In cooperation with research institutions we organize tests of linings and brake pads, performed both in laboratory conditions as well as on the road. Among other places, road tests are conducted on a testing track in the RDW Centre of Vehicle Technology and Information in Lelystad in the Netherlands, on the famous Grossglockner mountain in the Eastern Alps, and on a route around Mojacar in Spain, where changeable weather conditions are especially conducive to the generation of all types of uncomfortable sounds and vibration coming from the braking system. Breck products are also tested across the ocean. LACT (Los Angeles City Traffic) is a road test including driving around 4,972 miles (8,000 km) in around 20 days. Driving intensity in the test is similar to heavy city traffic. This test allows us to measure squeaking with various frequencies, brake pad wear and propensity for dusting of wheel rims. Our pads are also tested on racing tracks according to the UN’s Economic Commission for Europe R-90 and R-13 regulations, ISO and SAE standards and our in-house testing procedures in order to determine “cold” and “hot” braking efficiency as well as the reaction of brakes to speed. Therefore, before our brake pads reach the end customer, they go through a series of specialized and sophisticated tests. All this is done for you to rest assured that you are receiving a top-quality product. 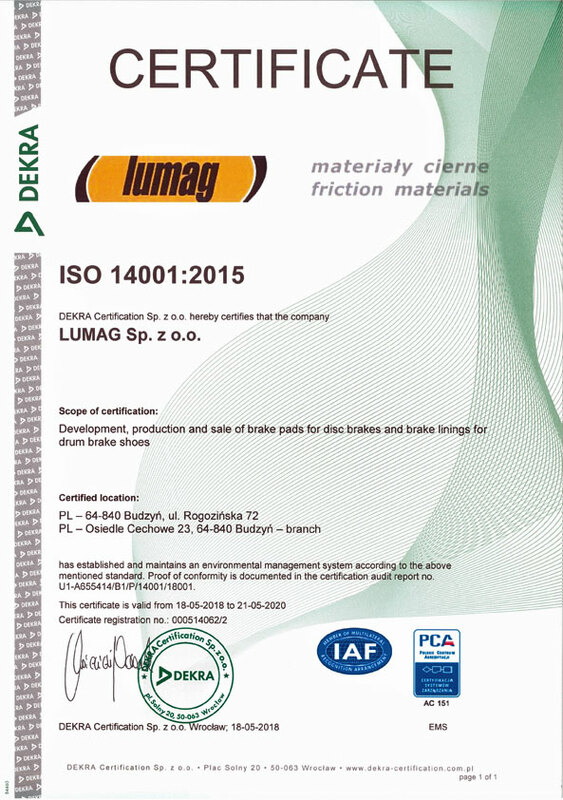 We accept full responsibility for our products, and that is why we permanently mark each and every brake pad’s back plate. 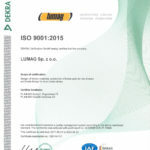 The presence of a manufacturer’s code, raw material code and a production date code and the additional print on the shim enables quick identification of the manufacturer and ensures durable marking. Product packaging includes information about intended application, thickness, friction material, packaging contents as well as a WVA number, a certification number and a Breck number. However, our products and their safety, although paramount, are not the only things that matter to us. We also care for the environment around us. That is the reason why in the manufacture of Breck pads we use environmentally-friendly friction materials, free of heavy metals and dangerous fibres, which directly lowers the amount of generated dust and makes it safer. In the manufacture of Breck brake pads we employ only water-dispersion-based adhesives free of organic solvents. 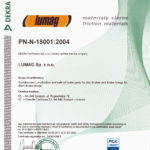 We have never used asbestos nor heavy metal compounds, which could pose a threat to the environment and vehicle users. We eliminated substances such as lead, mercury, cadmium and hexavalent chromium from our formulas. 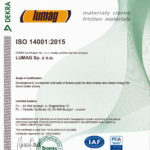 Within the framework of the environmental policy which we have accepted and implemented pursuant to the ISO 14001 standard, we are also responsible for our products following their end of life and disassembly from vehicles. To meet legal requirements related to environmental protection we perform rational waste management. Our company collects and accepts used brake pads from repair and servicing shops and recycles them. Materials we recover in this way can be used as components of raw materials used in the production of new car parts. All this is done, because we perceive safety as something having a much broader scope, which is not limited to the car and its “ecosystem”. For us safety encompasses the whole ecosystem we live in – the natural and social environment. Promoting safe operation of road vehicles by establishing standards for friction materials and monitoring compliance with these standards. Ensuring conditions of free competition between manufacturers, for example by opposing limitations resulting from patents. Developing and establishing common technical and commercial terminology.